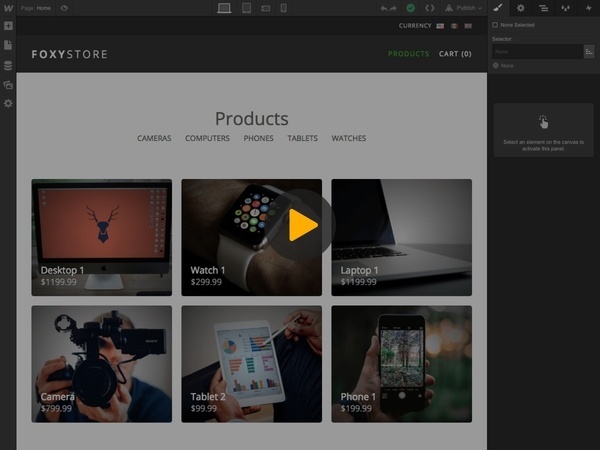 The following tutorial assumes you have already setup a products collection in Webflow's CMS and have added your products. Please refer to this article for more information. This integration assumes that all of your products are set up within a single Webflow collection, and that all of your products will be tracked for inventory. If the integration is unable to find a specific product code from an order in your products collection, it will trigger an error response for the webhook. Your product link or form must include the code parameter and optionally the quantity_max parameter to ensure a single customer can't order more than the inventory count of a product. From your Project Settings in Webflow, click on the Designer button at top. In Webflow's Designer, click on the "CMS" icon to the left. Choose your products collection from the CMS Collections list. Click on the "Add New Field" button. Select the "Number" field type. Give the new field a name. Ensure that "Allow negative numbers" is turned on. Click the "Save Field" button to create your new field. Click the "Save Collection" button to save your changes. Click on desired product from your products list. Give your product a starting inventory count. Click the "Save" button at top to save your changes. Repeat steps for each product. In Webflow's Designer, click on the "Pages" icon to the left. Under the "CMS Collection Pages" section, choose your products template. Select your purchase button or form element. Click on the "Element Settings" icon at top. Under the "Condition Visibility" section, click the plus sign to add a new condition. Set the element to be visible when Inventory Is Greater Than 0. Click the "Save" button to add condition. In Webflow's Designer, click on the "Add Elements" icon to the left. Set the element to be visible when Inventory Is Less Than 1. In the Foxy dashboard, click on the Integrations link at top. Under the "Webhooks" section, click the "Webflow" checkbox option. Click the "Integrate Webflow" button. On the next page, choose your desired Webflow website. On the next page, specify your products collection. Specify your product's code field. This must match the code value you are using in your product link or form. Specify your product's inventory field. Click on the "Update Webhooks" button to save your changes. Review your integration settings and run a transaction to test functionality.